You might think that since my husband is a paramedic, we have an elaborate first aid kit with all sorts of tape, bandages, creams and supplies for treating all sorts of emergencies. While those items and more can certainly be found in the back of his ambulance, our first aid kit is far from elaborate. In fact, it’s pretty simple. Over the years, we’ve been able to simplify and consolidate our first aid kit so it contains a few multi-purpose natural remedies. I also love that our first aid kit creates little waste (which can’t be said for kits you’ll find in stores). Antibiotic ointment – Many herbs offer powerful antibiotic properties (many are antiviral and antifungal as well). I keep a healing balm on hand that also acts as an antibiotic ointment. You’ll find the recipe below. Arnica balm – I have a confession. I like bruises. I think they’re cool. I even wanted a black eye as a kid. (Ok, obviously I didn’t think about how I would have to get that). But when I accidentally pulled over several sheets of RV paneling onto my leg, I figured I needed to do something about the bruises or they’d be there for a long, long time. Enter arnica balm. Arnica montana is great for relieving pain and helps bruises heal very quickly. Here’s a simple recipe for arnica balm. Bandages – Choose smaller squares and larger rectangular bandages. I prefer cloth so we can wash them and reuse them. You can cut up old t-shirts to use as bandages, and cloth pre-fold diapers are great because they’re so absorbent. Water bottle – I like to have a small bottle full of water in case I need to wet a cloth or bandage or if I need to rinse off a dirty injured area. Lozenges – Try making some of these herbal throat lozenges for scratchy sore throats and dry coughs. I’m a minimalist and I really like multi-purpose remedies. So instead of putting several different balms in my first aid kit, I make one that serves as an antibiotic, styptic and healing balm. Turn your oven on to 200°. When it’s warmed up all the way, turn it off. While it’s warming, melt the coconut oil and the shea butter in an oven-proof pan on your stove top. Add the herbs and move the pan into the oven. Let it steep there for at least 4 hours. Tare a container on your kitchen scale. Strain the infused oils into this container. Add coconut oil until it equals 7 oz. again. Rinse out the pan you used before and put the oils back in there. Warm the infused oil up on the stove top and add the wax, stirring until melted. Remove from heat and stir in the essential oils and Vitamin E oil. Pour into a clean container with a lid, label and store in a cool place. 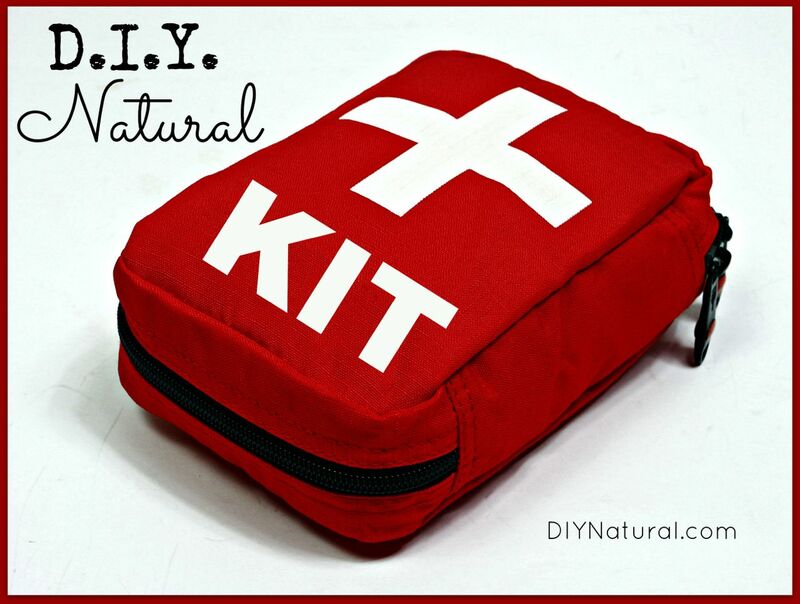 Do you have a DIY first aid kit? What’s in yours? Hi – I always have Rescue Remedy with me. It is a homeopathic remedy that helps with any kind of shock, sudden stress, whether it is physical, mental or emotional. If I have taken a fall or received bad news or generally feel anxious, it can really make a difference. It can be given to pets as well (best to check with a homeopathic vet on dosage). Also I would have bentonite clay in my pack for soothing burns, cuts, stings. Baking soda as well is good for those. Hydrogen peroxide is handy to have also. it on and went back outside. That’s SO awesome!!! Isn’t it awesome to get such good results from something you make yourself? Thanks so much for sharing! I have a question about the arnica balm. One of my husband’s 14-yr-old athletes had a pole vault crossbar land on her face today and she already is getting a black eye from it. Is the arnica balm safe to use on the surrounding skin to treat her black eye? I will see her on Monday evening, and this happened on Saturday, mid to late morning. Ouch! I’ve used it underneath the eye, just been careful not to get it in the eye. I’ve found other places online that recommend using arnica infused oil for black eyes. I would also recommend adding witchhazel. It is currently my favorite multi-purpose health item…It’s an astringent (i’m cursed with horrible acne even though i’m coming up on 30, and it is the only thing that works without making my skin worse! ), helps bruises, antiseptic, antiviral and antibacterial…and it’s safe to use on your pets! If you have the EOs for the herbs, you can use them. 🙂 I would do 5 drops for each one. Awesome! Thank you! Also, I notice y’all use the Mountain Rose Herbs website as your main supplier of herbs and oils. I’ve never purchased herbs, so I have NO IDEA how much 1 oz of an herb is or how long it will last me. I’d like to know if the price is worth it or not to buy from them. I’m looking at making the arnica balm and the healing ointments. If I purchased the minimum amount of herbs that I can, how many “recipes” of those would I get out of it? Arnica is pretty light, so a 1 oz. bag should last you a long time, at least 4 or 5 recipes. I found some calendula flowers yesterday in a 2 oz bag. They’re really light, too, and half of the bag would last me way longer than 4 or 5 recipes (at 1 T per recipe). Is Arnica’s weight comparable to calendula? Yes, both are pretty light. I get both in 1 lb bags and the bag of arnica is just a little smaller than the bag of calendula. I found some Arnica on the Monterey Bay Spice Company website. However, it’s not Arnica Montana. It’s Heterotheca incloides, from Mexico. Do you know anything about it? Does it have the same properties/strength as the Arnica Montana? I’ve google searched and not come up with anything. I just looked it up and from the sound of it, it can be used for the same thing. That’s what I was thinking from what I read on their website, but I couldn’t find anything elsewhere to back that up. All I could find was that it’s also called “false, or Mexican arnica” which doesn’t ease my mind any. I’d almost rather hear from someone who knows for sure before buying it, though. I’d hate to get some, mix up some salve, and have it not work. The price was only $8 for a pound, too!! TEA TREE OIL I always carry tea tree oil in my medical kit. Australian aborigines have used this for centuries. It’s wonderful for immediate application to any scrapes, cuts etc. It doesn’t sting and even children are fine with it. If you’re out hiking for example it’s a great first aid until you can get help or attend to the injury in a more dedicated manner. Of course it has many more applications. Big definatley on the Tea Tree Oil. Australian Eucalyptus Oil is also completely essential, apply it direct to bug bites (especially mosquito! gone in seconds!) or mix it into a balm to rub on chest or even under nose in more diluted quantaties) for congestion and sinus infections. I’ve heard it’s difficult to get outside Aus, but it’s and absolute must! Very cool! Excited to try this. I do have a single concern and question, however. I am allergic to bananas, and aren’t plantains from a similar family (I could be very wrong on that assumption)? Is there anything that could be substituted for it or could it even be omitted? It’s a rather weird allergy, based on reactions that people have given me when they find out that I really am allergic to them and don’t just have a massive dislike. Thanks! That’s what I thought the first time I heard about it, too. Plantain weed is different than plantains, which are banana like. It’s a common plant found around the country – some consider it a weed. Very interesting! I printed this out for reference. However, there is something here that is incorrect. Anaphylactic shock is a medical emergency. I recommend liquid or children’s chewable Benadryl at the same time you are calling 911. (Pills won’t dissolve in time.) This is different from “allergies.” Anything that involves swelling of the tongue or inflammation of the pharynx region is potentially life-threatening. And if you do have an allergy that severe, make sure you have an EpiPen. Thankfully I’ve never had to use mine. This kit is terrific! Thank you for keeping it simple and doable. I’ve been wanting to put a first aid kit together and this makes it easy and practical. This is what I had in mind when I began making my Remedy Rolls! I have a remedy for each of the things you mentioned. I love that you are including homeopathics in your kit, not many people are aware of how remarkable homeopathy really is! I apply it straight on myself, but dilute a drop in 1 tbsp coconut oil for the kids. I also don’t know what it is either and would like to know please. APIS is the ame of a Homeopathic remedy and 12 c is the strength. The most common strengths for at home use of Homeopathic remedies are X and C.
C is stronger than X.
Apis (short for Apis Mellifica ) is a great remedy for bee stings. Apis is Latin for Bee. Homeopathy is based on the principal that ‘like cures like’ So Apis 12 c is a great remedy for bee stings or anything else that is similar–puffy swollen. http://abchomeopathy.com/ offers a great beginning overview. It’s a great place to buy remedies. I am a homeopathic physician and would like to point out that Apis should always be used in a 15c dilution. 12c is more concentrated and therefore has a very minor potential for allergic reactions since it is made from bees. The 15 c dilution technically no longer contains any bee molecules, therefore the risk of allergic reaction is no longer possible. Thanks for your input Janine. I don’t see anything on your profile about your practice of homeopathy, just allopathic medicine. Do you have a web profile we can check out? Thanks. I do not have a site at this time as I am in training to be an Integgrative Medicine physician. Thank you for your wonderful website helping us to decrease the amount of chemicals we are being exposed to. Thanks Janine. Is there a good place you recommend getting it from? I recommend Boiron for single ingredient homeopathic medications. They have high quality products. The company originated in France decades ago. Their products can be found at health food stores and many online sites.